We are very excited to announce the arrival of our latest natural skin care range from Ruby Red, a UK based company founded by Martine Buford and Mike Ruby. During an 18 month sabbatical in South East Asia, Martine saw the benefits of using natural ingredients in skin care as they are just as effective as any synthetic chemicals; and much better for your skin! What makes Ruby Red cosmetics so exciting and unique is that they were inspired by traditional British apothecary methods but have an urban up-to-date twist. Ruby Red focuses on active natural ingredients, producing body treatments with unique, pure aroma, carefully blended by hand for optimum therapeutic benefits. Ruby Red’s Reviving Body Cleanser gently purifies and soothes dry skin with Aloe Vera extract, rich in natural polysaccharides and botanical foaming agents of corn and coconut. Red Mandarin with Key Lime and Coriander offers energising and toning oils whilst wild Cedarwood gives a warm, invigorating scent. 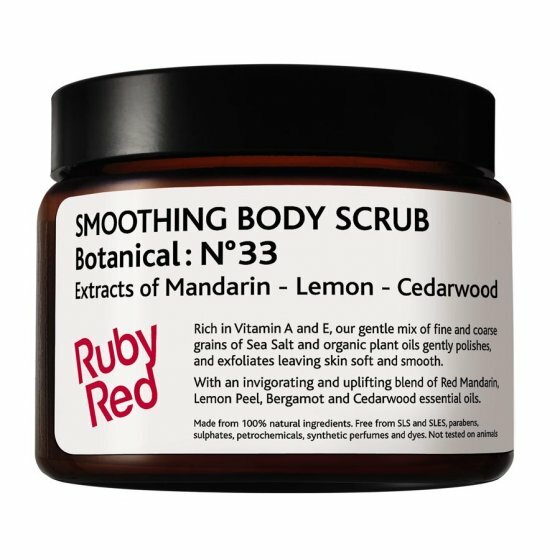 Ruby Red’s Smoothing Body Scrub is created from natural mineral salts to exfoliate and revitalise the skin. Salts taken from the Middle East’s Dead Sea gently exfoliate and encourage the expulsion of toxins helping to regenerate new skin cells and leaves skin looking healthy and glowing. A blend of Sunflower Seed, Jojoba and Macadamia oils nourish the skin whilst toning and rebalancing oils of Red Mandarin, Lemon and Wild Cedarwood help to improve circulation. The reason we love Ruby Red cosmetics here at Ethical Superstore is that they are made in the UK from plant ingredients. All Ruby Red skin care products are made without Sodium Lauryl Sulfate (SLS), parabens, or any petroleum based chemicals, which makes them suitable for even the most sensitive skin; perfect for everyone. You may wonder how their products can have such a wonderful aroma without the use of synthetic perfumes; it is because Ruby Red uses natural pure essential oils to cre ate the distinctive scents of its skin care range. Made in the UK, the nutrients and vitamins in the Ruby Red range all come from plants to work in harmony with the skin from the outside and is formulated without sodium lauryl sulfate, harsh chemicals or parabens to prevent skin irritations. 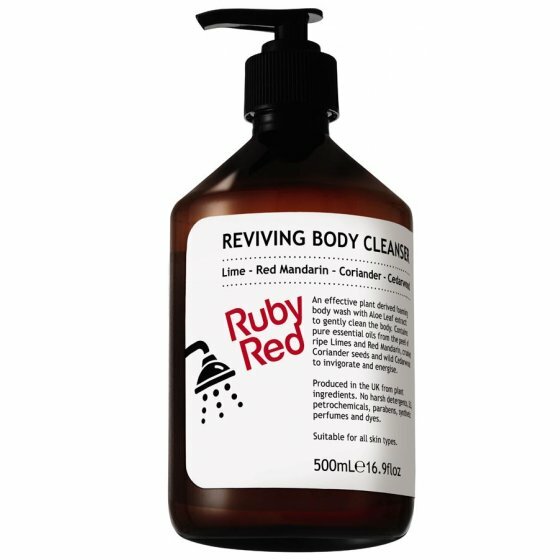 Ruby Red’s Reviving Body Cleanser recently became a finalist for the Best New Natural Beauty and Spa Products in the Natural and Organic Awards 2013. So go on, see what all the fuss is about!